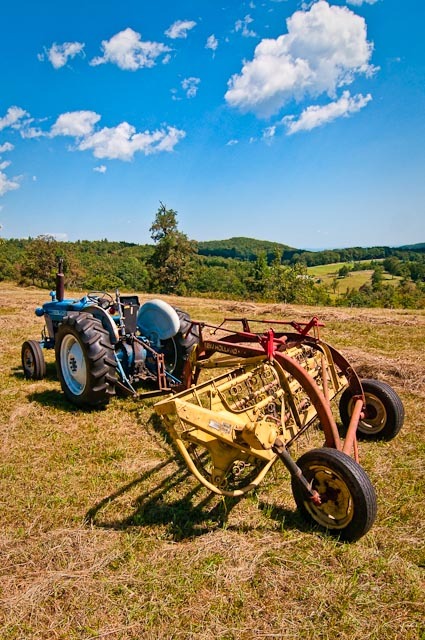 This old Ford tractor with hay rake in tow had been sitting idle for some time, in a high pasture along the Blue Ridge parkway in Virginia. I drove by it before I stopped to finally get out and snap its picture. That’s the way it is for me usually…I see things I want to photograph, but always too late to safely stop as I drive past. So, I make a mental note to catch it later on…assuming I go back that way. Nikon D300, processed in Lightroom v3.2.